HIp Hop..Rock..Latin..Pop..Country..Oldies. Whatever your taste, We've got the Beat and We'll Bring it to You. Our library of over 35,000 songs is sure to please. Invite us to your next event and we'll get things poppin'! Let our experience entertain you and your guests. As the Master of Ceremonies, we are able to relieve you of the details of your event; leaving you to sit back and relax or get up and dance!!! Having a backyard wedding? on a dock? at a campground? or other remote location? With our lapel mic for the minister, every guest will share the emotion and passion as you exchange your vows. Our handheld mic is also available for readings, dedications, toasts, roasts, you name it. Our separate sound system is available for a reception that is in an alternate location. No tear down and set up time in between. This allows a smooth flow for you and your guests from wedding to reception. Our sound systems are very versatile and mobile. Allowing us to perform in most settings. All we need is power. Do you need help making it all official? Rev. Terry Joe Ruiz is at your service. Ordained by the Universal Life Church, Rev. Terry is able to perform your wedding nuptials. Together, you will create a unique wedding service specifically taylored to your interests and philosophy. Strobe lights.....Starballs......Laser Lights.....Black lights......Fog Machines Flourescent streamers for the kids!! We'll get your party started!! Yeah!! Bring Friends in Low Places or All the Single Ladies.... We can Crank That! All Night Long!! OMG !! So you think you can sing? GIve it a go...we've got the words and music to over 20,000 songs. Karaoke can be a very surprising addition to any party or event. Need a Dance Floor? You can rent ours 12' x 16', or larger upon special request. Set the mood with color; purple, red, yellow, green, blue, aqua, you name it. Maybe a starry sky for your first dance. We have just the right touch to make your event memorable. 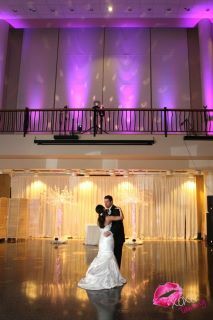 Photo taken by xoxo Kissed by Tammy Featuring our purple uplighting and star ball effects.